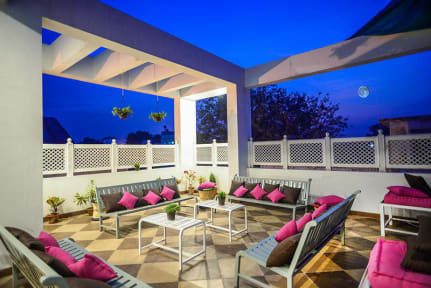 Zostel Jaipur Hostel i Jaipur, Indien: Reservér nu! Zostel Jaipur is two-time best Indian hostel award winner. Centrally located within the walled city, at Hawa Mahal - this classy backpacker hostel is the pride of brand Zostel. Located in the heart of the city, Zostel Jaipur is close to all the major attractions of Jaipur. The colourful interiors of the hostel mirror the spirit of the city perfectly and that is why it has been awarded the best hostel in India a couple of times in last 4 years. Every day with us is going to be happening and worth remembering. We have ears for your travel void. Chill out with like-minded people from around the world and travel without hassles and share laughs and experiences. Our friendly local staff will help you explore best of jaipur - from small shops to royal mahals, from roadside stalls to the most elite restraunts, with a charm that combines eras of The Maharajas.